I am Sanghamitra. I really enjoy your blog. I have so much to learn in terms of fashion from your blog. 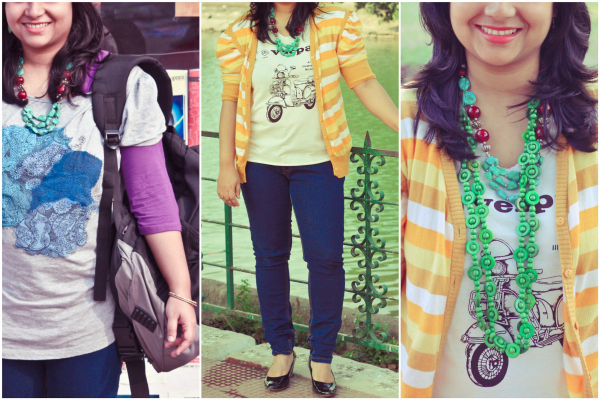 These days I am experimenting with my style with whatever I have already in my closet rather than buying new outfits. I am trying to Mix and Match. I might have made a few mistakes here and there while trying to put an outfit together as I am a new entrant in this fashion world. You can say that I am still trying to get it right. But above everything else, I have noticed one thing - when I dress up in my own style, I feel more confident and happier. Also, I believe that fashion is the extension of our own personality, a way of expressing ourselves and our creativity. Nowadays, even if I go to the neighbourhood grocery store, I make sure to wear my flat pumps instead of a slipper, and wear a proper outfit instead of a casual dress. Thank you for the lovely compliments. I am glad you enjoy reading my blog. Also, thank you for sending in your pictures. I think you are doing very well. I do not see any mistakes in these outfits. Love the colors, accessories, and layering. You have already got it right! I definitely believe that when you look good, you feel good and confident - and you are definitely looking both! What do you all think? Sanghamitra's look is fun, no? Thank everyone who has sent their pictures for the Reader's Spotlight. I will continue to post them on Friday in the order that I have received the email. If you are new here: this is a segment where my readers get to share their style or ask of suggestions (if they need any!) from all my readers. So if you have been inspired by my blog then Email me your outfit pictures for this feature. If anyone wishes to stay Anonymous just say the word! I follow Sanghamitra too and I think she is doing a great job! I love the colours that she is wearing in the outfits. They are so soothing and pretty! Tanvi, thank you so much for featuring me ! I was waiting for this moment! She looks lovely - I love the stripes, so vibrant and fun! 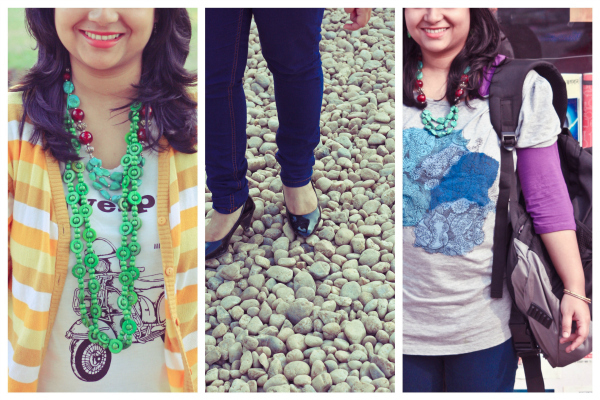 I've been reading Sanghamitra's blog for a while now..and I love her bright accessories! Wow!! Love all the colors. :) U r doign a gr8 job by encouraging fellow fashion bloggers. Her necklace is super pretty! Sanghamitra got it all right - it's about expressing yourself and having fun - being yourself. She looks lovely! I like the yellow and green beads combinations!